Guava purees are generally thick and smooth products which is obtained from processing of guavas including removal of the insoluble fibrous part and can pass through a fine sieve. Fruit purees are commonly used for the preparation of beverages, syrups, ice cream topping, jams and jellies, dressing and fruit sauces. Most common form of guava purees are frozen, canned, and aseptic packed. Few companies even dry guava puree powder for enhanced shelf life of the product and easy exports. Guava puree market is driven by demand from the food and beverages industry. Advancements in guava cultivation and processing has augmented guava puree supply globally over the years. Demand is concentrated in the western part of the world while supply of guava is concentrated in the eastern part of the world. However, demand in North America and European region is met by South American and African countries. On the other hand, guava puree demand is locally consumed in India and rest is exported to Middle-Eastern countries mainly. Guava fruit production is often hampered with the incidence of El Niño and La Niña events, with La Niña event affecting nd El Niño affecting Asian region restraining guava supply for guava puree production. Lack of post-harvest technologies and fruit processing technologies in major guava producing countries like India and Brazil is limiting potential growth of guava puree market. By variety, the global Guava Puree market is segmented as tropical white, tropical pink and other varieties. By application the market is segmented as infant food, beverages, bakery & snacks, ice cream & yoghurt, dressing & sauces and others. Furthermore, by nature, the market is segmented as organic and conventional. 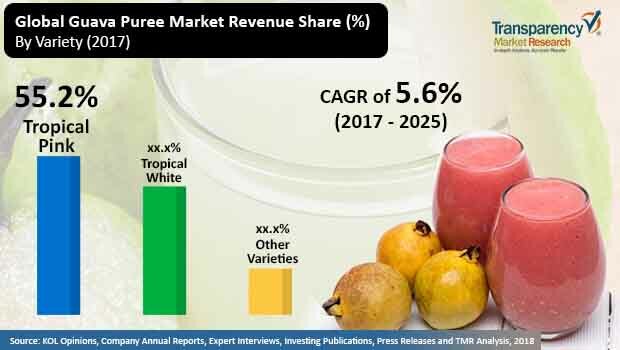 Among all the varieties, tropical pink variety is estimated to account for 56.3% of market share, in the overall global guava puree market, in 2017. On the basis of region, the market in APAC is projected to dominate the global Guava Puree market both in terms of value and volume in 2017. APAC is expected to gain significant market share in revenue terms by 2025 end. This trend is attributed to the consumer dependence on Guava Puree as demand from various sub- segments like blends and nectars in the beverages industry is on rise in this region. Moreover, Asia-Pacific followed by Latin America is projected to exhibit significant CAGR in terms of value during the forecast period. Some of the major companies operating in the global guava puree market are Cobell Limited, Döhler Group, Grünewald Fruchtsaft GmbH, Kiril Mischeff, Ariza B.V., Shimla Hills Offerings Pvt. Ltd., SunOpta Grains and Foods Inc., Jain Irrigation Systems Limited, Bajaj Agro Foods India Ltd., Tricom Fruit Products Limited, Galla Foods Pvt. Ltd. (Amara Raja Batteries Ltd.), iTi Tropicals, Capricorn Food Products India Ltd., Golden Hope Plantations Bhd (Sime Darby Bhd. ), Sresta Natural Bioproducts Private Limited, ABC Fruits, La Fruitière du Val Evel, Allanasons Private Limited and Jadli Foods (India) pvt. Ltd. This report provides forecast and analysis of the global guava puree market. It provides historical data of 2015 along with estimated data of 2017, and forecast data up to 2025 in terms of revenue (US$ Mn). The report also includes macroeconomic indicators along with an outlook on Guava Puree for the global market. It includes drivers and restraints of the global guava puree market and their impact on each region during the forecast period. The report also comprises the study of current issues with consumers and opportunities for guava puree products. It also includes supply chain analysis. In order to provide users of this report with the comprehensive view of the market, we have included detailed dashboard view of the market which covers analysis of strategies, revenue, and market presence. The competition landscape provides a detailed comparison of guava puree manufacturers on parameters such as product offerings, and key strategy. The study encompasses market attractiveness analysis by variety, application, nature, and region. The guava puree report includes company profiles and the revenue generated from the companies across North America, Latin America, Europe, APAC, and MEA. By variety, the global guava puree market is segmented as tropical white, tropical pink and other varieties. By application, the market is segmented as infant food, beverages, bakery & snacks, ice cream & yogurt, sauces & dressings and others. Furthermore, by nature, the guava puree market is segmented as organic and conventional. Weighted average selling price for guava puree products are considered to estimate the market size by top countries in each region. These prices are tapped at the regional level. These currency figures are then converted to USD to offer forecasts in one consistent currency standard. Furthermore, TMR also takes into consideration the latest annual exchange rate to reflect the impact of the most recent economic conditions for that particular country. All key end users have been considered and potential applications have been estimated on the basis of secondary sources and feedback from primary respondents. Country demand patterns have been considered while estimating the market for various end users of Guava Puree in the different regions. Global market numbers by variety have been derived using the bottom-up approach, which is cumulative of each country’s demand. The company-level market share has been derived on the basis of Guava Puree penetration. The market has been forecast based on constant currency rates. The extensive secondary research was carried out to understand the end-use, and distribution channel of the product segments covered in the study. Sources of data include industry journals, company websites, annual reports, SEC filings, press releases, investor presentations, association blogs, data sources such as company revenue, sales, and market scenario of guava puree manufacturers. During the research, we have also tracked the market for past 3-4 years where we have scrutinized the industry overview for food & beverage sector, retail market, and other strategic developments, production, growth, transition, and evolution of the market. Secondary sources include Factiva, and Hoover’s, and company annual reports and publications. The report provides detailed competitive and company profiles of key participants operating in the global market. Some of the major companies operating in the global Guava Puree market Cobell Limited, Döhler Group, Grünewald Fruchtsaft GmbH, Kiril Mischeff, Ariza B.V., Shimla Hills Offerings Pvt. Ltd., SunOpta Grains and Foods Inc., Jain Irrigation Systems Limited, Bajaj Agro Foods India Ltd., Tricom Fruit Products Limited, Galla Foods Pvt. Ltd. (Amara Raja Batteries Ltd.), iTi Tropicals, Capricorn Food Products India Ltd., Golden Hope Plantations Bhd (Sime Darby Bhd. ), Sresta Natural Bioproducts Private Limited, ABC Fruits, La Fruitière du Val Evel, Allanasons Private Limited, and Jadli Foods (India) pvt. Ltd.